True freedom is the power to choose; to live life on your terms, not somebody else’s. Owning a personal aircraft means breaking free from the chains of traditional travel and treating the world like your playground. One minute, you’re finishing up a week at the office. The next, you’re relaxing on the sandy shores of Guaymas, Mexico with your spouse. As you admire the rich, mountainous landscape, you feel inspired to book your next adventure. This time, it’s New Orleans with a group of friends to enjoy the nightlife. You jump online, login to your scheduling portal, and book your flight. Back at home, the days pass quickly in anticipation. On the day of departure, a limo arrives to pick you and your comrades up in style. Lone Star Executive is your preferred airport, and your DA-62 is already on the tarmac: cleaned, fueled up, and cleared for take-off. In minutes, your backpacks are stowed away, and all passengers are comfortably seated—three in the middle row, one in the back. As the aircraft takes flight, your friends relax and banter about the adventure ahead. Already, you can tell that the memories made on this trip will be priceless. This type of lifestyle may sound unfathomable, but for EvolveAir customers, it’s a reality. Our mission is to give you the world through affordable private air travel. Life is about more than minutes and hours; it’s about making memories worth sharing. With the DA-62, the sky is no longer your limit. Meet the next generation of twin-engine aircraft. 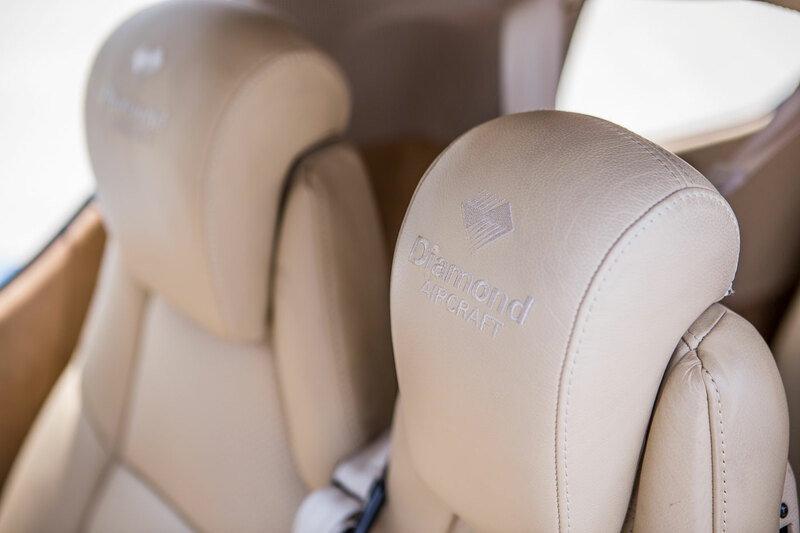 The DNA of a Diamond aircraft has always consisted of leading-edge technology. However, Diamond doesn’t innovate for the sake of novelty; they innovate because it’s the right way to engineer for superior efficiency, performance, and safety. Diamond aircraft are built to dazzle, from the gallant DA-42 with advanced air monitoring sensors powerful enough to fly through the dense ash cloud of an active Icelandic volcano, to the DA-36 E-Star, which became the world’s first aircraft with a serial hybrid electric drive system. Never has this been truer than with their latest model, the twin-piston DA-62—a genuine diamond in the rough. Fuel economy and advancements in single-engine safety were once thought to have eulogized twin-engine aircraft. From the ashes rose the DA-62. Master engineers set out to create a plane that was simple to operate, incredibly fuel-efficient, and remarkably luxurious. What they brought to life is a next-generation twin-engine flying luxury SUV. 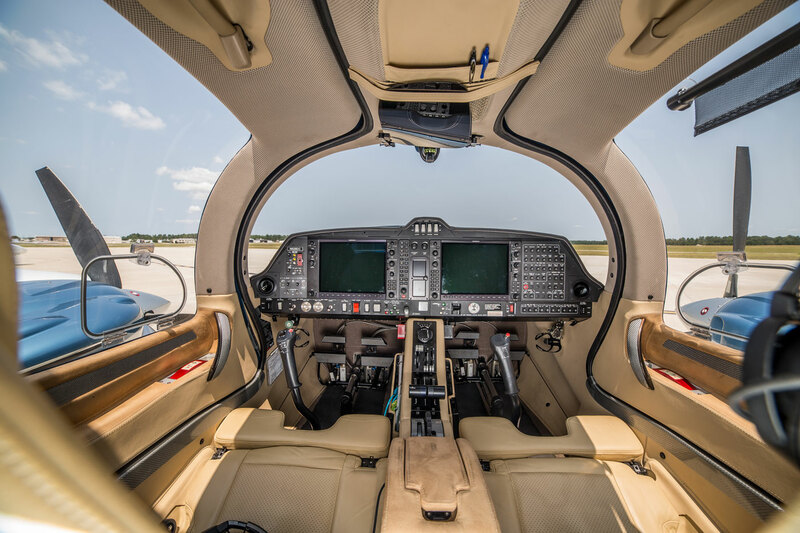 The DA-62 runs on diesel, features best-in-class handling, stability, and control, and takes more passengers farther and faster than ever before. 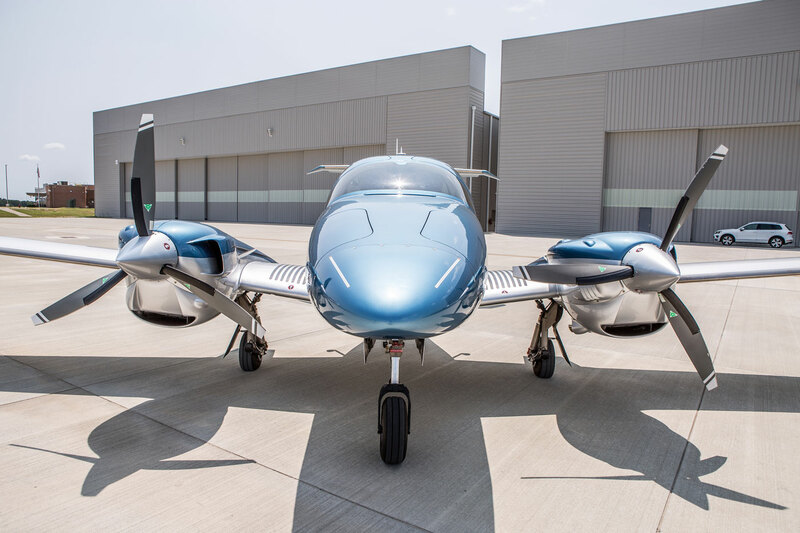 A sleek, all-carbon composite airframe, graceful wingspan, tall tail, wide cabin, and twin gull-wing doors create a striking contrast between the elegantly sculpted DA-62 and brawny gasoline-powered single-engine aircraft. 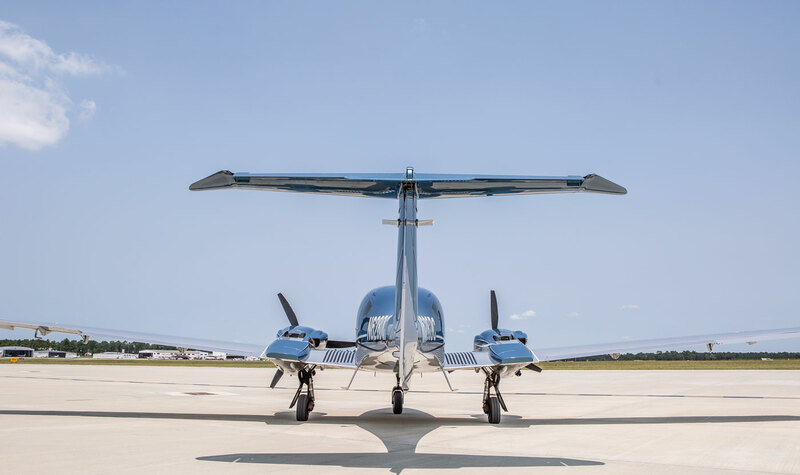 As you approach the front of the aircraft, the advanced geometry of the DA-62’s 3-blade MT hydraulic propeller is sure to catch your attention; its unique design promises greater efficiency, smooth cruising, and a whisper-quiet cabin. Two cargo compartments in the nose of the plane provide over seven feet of storage, and an additional cargo compartment near the rear of the aircraft offers maximum loading flexibility to suit any mission. Choose from an expansive palette of exterior paint schemes, such as carbon, light silver, gold and sapphire metallic, or completely customize your look by drawing from any color in the spectrum and a multitude of paint designs. Enter the aircraft through one of the twin gull-wing doors, or bypass the cockpit and step directly into the cabin via a third oversized door near the rear of the aircraft. There’s little question the DA-62 belongs on the shortlist of the greatest light twins ever. Do more. Be more. Spend less. Nothing says we mean business like arriving at a meeting or work conference in a company-owned DA-62 twin-engine aircraft. 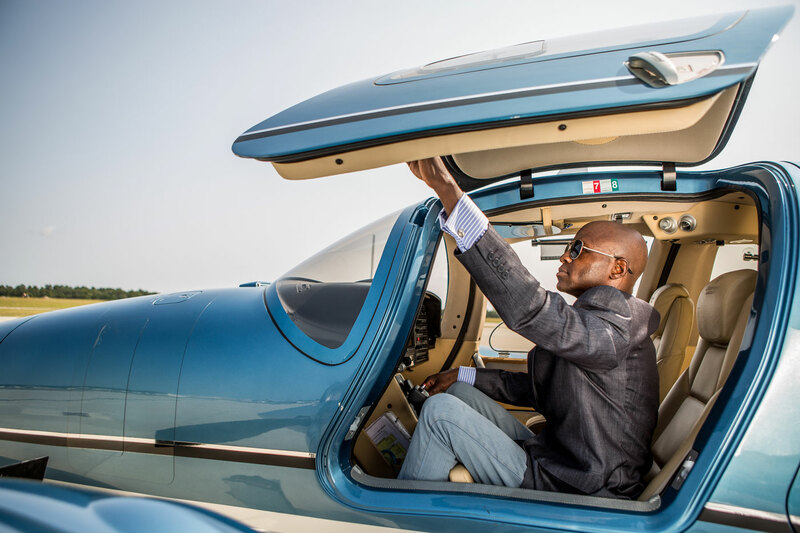 You might think that this type of lifestyle is out of reach for your business, but thanks to EvolveAir’s shared ownership program, purchasing a business aircraft has never made so much financial sense. As a shared owner, you only pay for 25 percent of the cost of owning an aircraft. You may even qualify for certain tax benefits! With first-class support for everything from financing and insurance to aircraft maintenance and flight planning, aircraft ownership won’t take time or focus away from what matters most—your business. Time is money, and few aircraft respect that fact like a Diamond-engineered aircraft. The DA-62 only consumes 11.8 gallons of fuel per hour and can travel more than 1,500 miles on a single tank. With such exceptionally low fuel burn, even at full passenger capacity, this aircraft delivers an incredible return on investment and will turn the entire state of Texas (and beyond) into your immediate business territory. 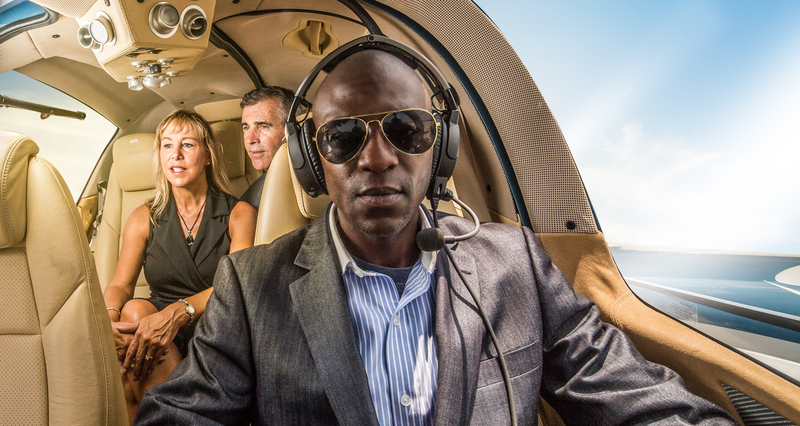 Fly top executives to Austin, San Antonio, or Dallas in an hour or less. Impress clients with a quick golf trip to Orlando. Spend more face-to-face time with national accounts. Make your presence impossible to ignore. Whether you’re planning a quick weekend jaunt to New Orleans or a week-long vacation to Destin, Florida, EvolveAir wants you to own every second of the adventure. 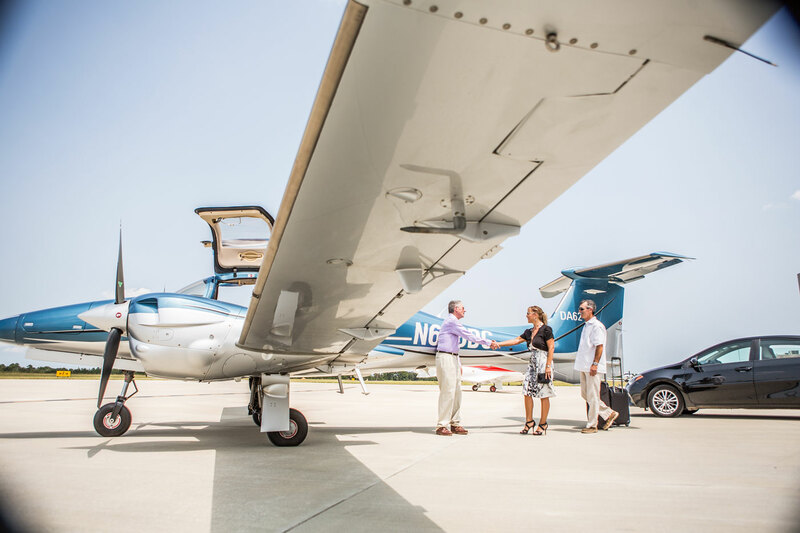 Through our shared ownership program, you can live the lifestyle of private air travel for only a quarter of the cost of owning and maintaining an aircraft. Included in your fixed, one-time cost is an annual allotment of flight hours and all the support you need for insurance, taxes, and flight planning. EvolveAir will pick up or drop off your aircraft at any airport in the Greater Houston area. Your only responsibility is to pick a destination, sit back, and enjoy the journey. 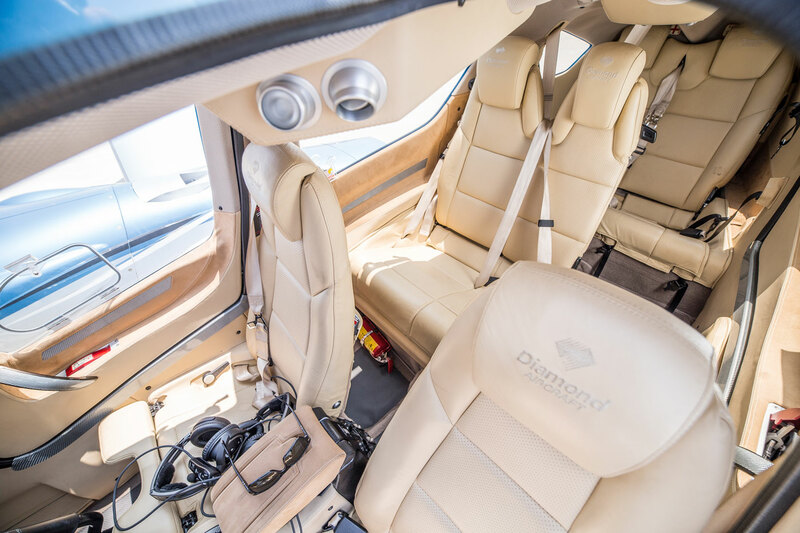 Thanks to the DA-62’s optional third-row seating, there’s plenty of space for five adults and two children. You also have the option to remove the third row completely to make extra space for luggage, golf clubs, ski gear, and other travel luxuries. Visit your kids at college in Dallas. Take your friends on a weekend trip to South Padre, or finally go on that romantic trip to Nashville—all in under two hours. The nation is your new backyard. Speed. Style. Space for seven. The DA-62 breaks the barrier between form and function with an interior design that exquisitely harmonizes style, comfort, and utility. Every detail of the cabin, cockpit, and cargo areas emulates the class and sophistication of a luxury SUV. Choose from two interior design schemes—classic onyx or soft cashmere beige. Brilliant LED interior lighting will reveal a spacious 4-foot, 2-inch cabin with plenty of seating for up to seven passengers! Both pilot and co-pilot chairs are reclinable with adjustable lumbar support. A three-seat second-row bench offers plenty of leg and elbow room for passengers and an additional foldable third-row bench provides two more seats or can be removed to create sizable cargo space. Run your fingers across the rare handmade genuine leather seats, textile trim paneling, and satin-finished composite inlays. Sink into your chair and get comfortable with adjustable arm and leg rests. You’ll find several compartments, cup holders, USB outlets, and adjustable air and light units within arm’s reach. Once in flight, the cabin remains surprisingly quiet thanks to the aircraft’s diesel engines and specially-engineered 3-blade propeller. 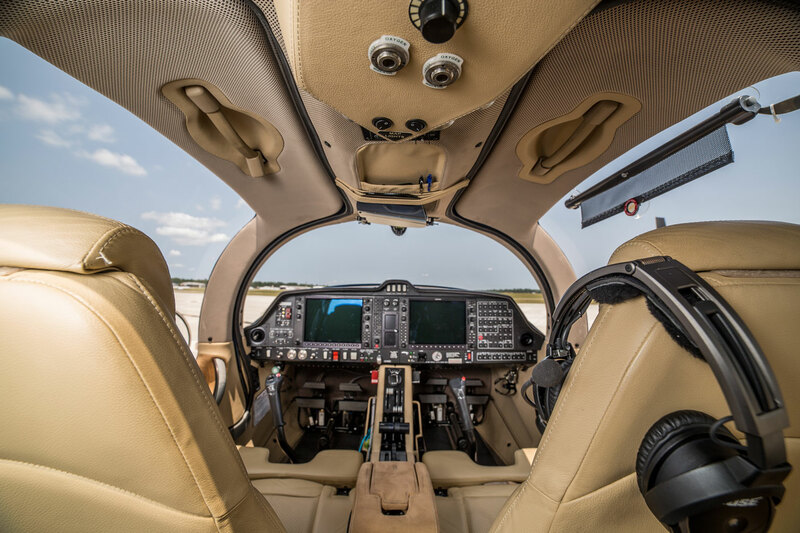 The flight deck features a minimalist design but spares no technology thanks to the advanced Garmin G1000NXi avionics with Automated Flight Control System, integrated weather radar, yaw damper, electronic stability, traffic alerting, synthetic vision, and more. Experience the world on your terms. Never again waste precious quality time dealing with crowded airports and inconvenient flight schedules. The DA-62 is your ticket to a frictionless travel experience anytime, anywhere. Pick a destination and date—we’ll take care of the rest. 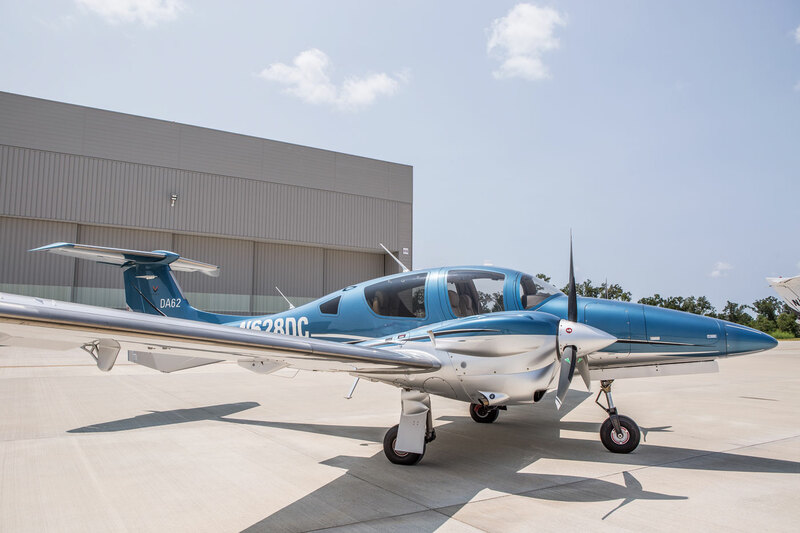 Powered by twin 180 horsepower jet fuel engines, the DA-62’s 48-foot wingspan will have you soaring 20,000 feet above sea level at over 220 mph. 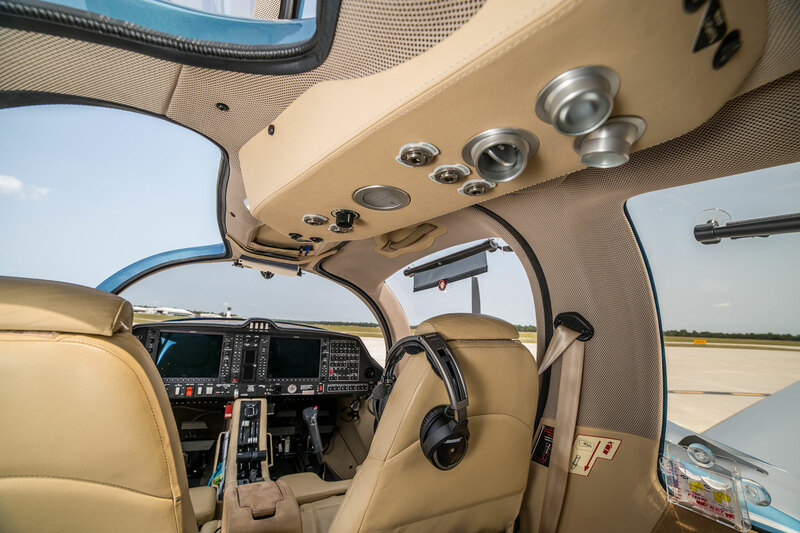 Despite the roaring speed and strength of the DA-62, the cabin remains a tranquil environment to catch up with friends, talk business with colleagues, or simply relax. 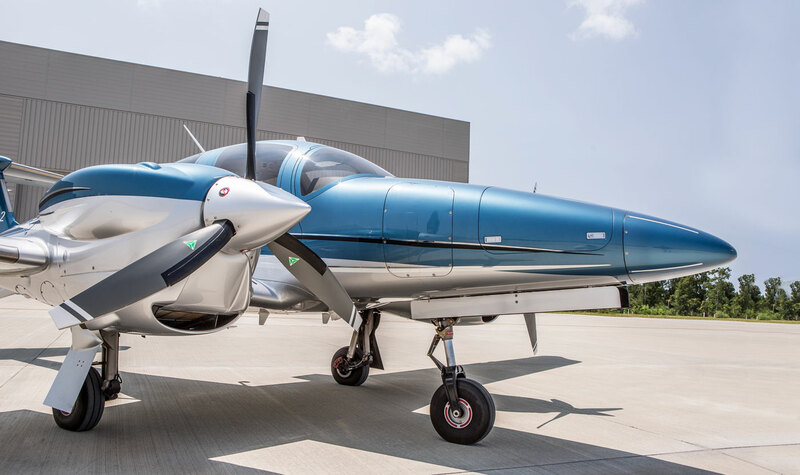 Single-engine aircraft safety has come a long way, but nothing compares to the assurance of two engines and incredible single-engine performance. Without a worry in sight, you’ll enjoy every minute of every adventure. Max Operating Altitude: 20,000 ft.
Take to the sky and experience a world of possibility.